Ask any Food As Medicine graduate what their favorite thing about the program is and for sure their difficulty will be in choosing between the food and the people. It’s a given that the education is superlative– science-based, heart-centered, practical and inspiring. FAM 2011 will make it an even dozen times we’ve presented it, and we have gotten very good at it, indeed. Rebecca Katz is designing the food, so again, prepare to be both nourished and dazzled. The people? Robin Gentry McGee is a perfect example of our amazing attendees. We got to know each other well after attending Food As Medicine in June 2009, when she and her husband Brian decided they wanted to try to rescue their hometown of Dayton, OH from its unenviable designation as one of the top (bottom?) 10 Failing Cities in America (ouch, Forbes! Not your nicest list) by creating a program of renewal, including nutrition and mind-body medicine. Would the Center care to help? Indeed! And while that program hasn’t yet materialized (funding is so often the rub), it turns out this is typical Robin. When she was diagnosed with cancer, she attacked it like a Harvard MBA, and learned enough to help heal herself. When her beloved dad experienced a traumatic brain injury (TBI) and was languishing in a hospital, she concocted a healthy whole foods feeding tube formula, which got him out of the hospital and enjoying an increased quality of life. Read about it in her new book, A Turn for the Worst: Traumatic Brain Injury and a Daughter’s Search for Answers. 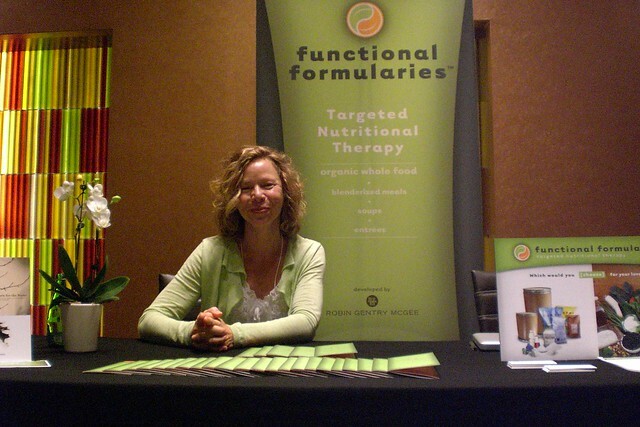 She’s the recipient of three recent entrepreneurial awards and will be launching her whole foods feeding tube formula at Food As Medicine next month, the first product from her new company Functional Formularies (website coming soon at functionalformularies.com). Wow! Seeing is believing. What does she think about Foods As Medicine? When I came to FAM I was on a mission, to immerse myself in food as medicine as well as mind-body medicine. What the Center has provided me in both of these areas is nourishment in my quest for a deep level of healing, not only for myself and my father, but for all beings. CMBM and FAM continue to bring together the most brilliant minds in medicine today, and I am honored to be a part of it. Thanks, Robin! We’re proud to know you. Jo Cooper, Online Communications Editor, is the editor of the Centering blog. She posts on www.facebook.com/MindBodyMed and tweets @MindBodyMed and about marketing, design and photography on @JoCooperStudio. Questions about the blog? Contact her at [email protected]. Fantastic! The most important new product I’ve seen in a long time. I can’t wait to look this up for details, I hope the necessary providers are open to this, and can get it in all hospitals. Awesome! I’m glad someone has finally moved forward with this. Congratulations Robin! What a great service to people who are most in need of real food! about a similar situation where they pureed real food in a vitamix and poured it through the tube – the optimal situation. I need to know more. My 21 year old son suffered a traumatic brain injury last Dec. and the formula food is nothing but corn syrup and lots of other words ending with -ose. I am just beginning to look for information, but know I have to find something more nutritional for him. Carolyn, I’m so sorry. I have 3 sons and I can only imagine how hard this is for you, your son and your family. Robin is amazing, and I’m sure she’d be happy to speak with you. To learn more visit http://functionalformularies.com/ and email [email protected]. Truly hoping this helps, and wishing you all the best.